Ryan Goodfellow celebrates the last penalty by Dumbarton leading East Fife to victory. The league season has yet to start for East Fife, but already the signs are looking very good for a positive campaign ahead. Pre-season results and performances were impressive, but it’s always best to be cautious about using them as an indicator for when the real stuff kicks off. But what is undeniable, and will please the coaching staff at Bayview though, is that the Methil side has taken those showings in pre-season, against Hearts and Raith and particular, into the competitive campaign. Bayview boss Gary Naysmith pointed out after his side had dumped Dumbarton out of the League Cup on Saturday that East Fife had faced three Championship clubs in a row, Raith and Falkirk before the Sons, and had been out-played by none of them. It’s clear the standards set in pre-season performances are being carried into competitive business. 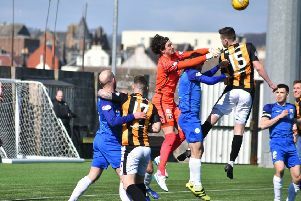 Seven days before Dumbarton arrived at Bayview, East Fife had made Falkirk work until injury time to eventually get their Petrofac Training Cup round one winner. Those who watched that performance were not surprised to see the side push another Championship team all the way on Saturday. Dumbarton have added well over the summer but didn’t look a team playing two leagues above East Fife. The game was short on chances but burst into life in the second half when Nathan Austin coolly lobbed the experienced Mark Brown. East Fife weren’t ahead for long, though, and Kevin Cawley nodded Sons back in front. The game had been short on real opportunities so it was little surprise really that it had to be settled from the penalty spot. With Allan Walker and Craig Sutherland missing, Dumbarton had two penalties to win the tie. But home ‘keeper Ryan Goodfellow kept his side in it with a couple of good stops which were followed up by decent penalties from his team mates. When Declan O’Kane netted for the Fifers the tables had been turned and Cawley needed to net to keep the Championship club in the League Cup. Again Goodfellow stood up well and the Fifers headed into the second round draw on Monday afternoon. The win was by no means undeserved at all and the club now heads into the league season with a real spring in its step.